Stains are a natural part of life, especially when you have a family or pets. When they happen, it’s always best to act quickly to minimize any potential damage. 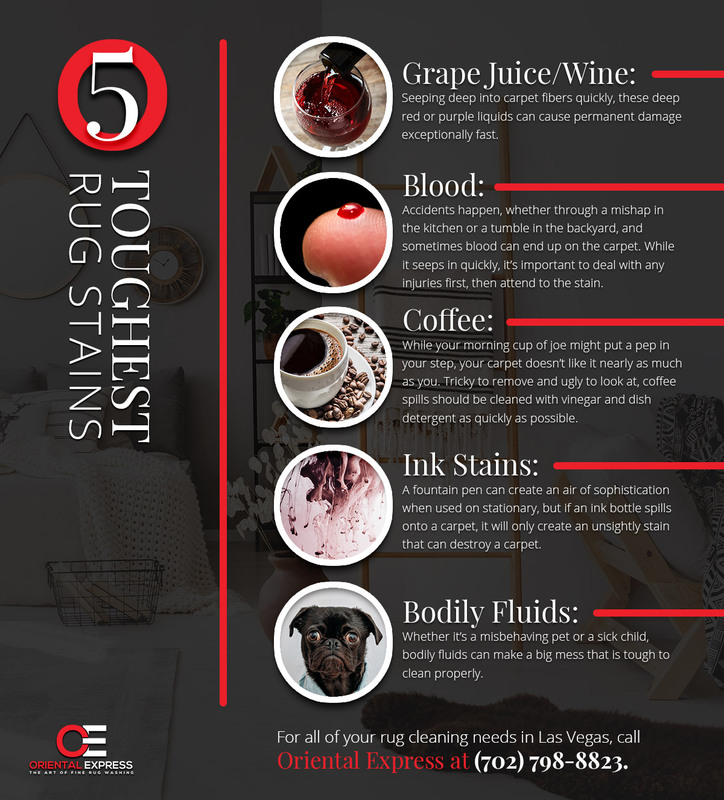 With that in mind, we’ve put together this list of the five toughest stains to be on the lookout for, along with some tips for treating them. If your DIY stain fighting doesn’t get the job done, call the rug cleaning experts of Las Vegas at Oriental Express! The deep, dark red or purple color of these delicious drinks can wreak havoc on a rug or carpet if not treated properly. This is due to how quickly they seep into the carpet fibers and immediately begin to set in. If these stains aren’t treated quickly, it can result in permanent damage. In the event of a spill, treat it immediately with hydrogen peroxide (not recommended for darker rugs or carpets). After that, spray it with a combination of water and carpet cleaner to reduce any potential damage. Accidents happen to us all, and whether it was a mishap in the kitchen or a tumble in the backyard, some blood might end up on the rug in the mad dash to handle the situation. Of course, the most important thing to do in this type of situation is to address the injury first. Once that is done, attend to the stain. Similar to wine and juice, it will seep in quickly and leave behind a dark stain after drying. While it may put a pep in your step, your carpet or rug won’t take as kindly to your morning cup of joe. As one of the most common stains, coffee isn’t something to take lightly. They’re very difficult to remove and if left untreated, they’ll leave behind an ugly yellowish-brown stain. In the event your espresso spills onto your rug, use vinegar and dishwasher detergent to minimize the damage done. If you’re a fan of perfect penmanship, you know how beautiful a fountain pen or quill can look on a nice sheet of stationery. However, if an inkwell is spilled on your rug, it won’t have nearly as nice of an appearance. This can even happen when a fountain pen malfunctions, leaving an inky mess like you got in a fight with an octopus. If ink isn’t cleaned thoroughly, it can permanently damage a rug or carpet. First, spot clean the spill with some ammonia, then steam clean it to pull the rest of the ink out. For anyone with kids or pets, we don’t need to tell you how messy life can get. Whether it’s a new puppy getting trained or a little one fighting the flu, their bodily fluids can lead to incredibly tough stains, not to mention the odor they can leave behind. Use baking soda to remove the moisture and reduce the odor first, then treat the stain with a carpet shampoo or cleaner. No home is stain-free, because life gets messy. The best thing you can do is try to minimize damage and treat stains quickly. Need some help getting rid of a pesky stain on your prized rug? Call Oriental Express in Las Vegas today to learn more about our cleaning services.